Celebrate the 15th Anniversary (1996 - 2011) of an inspirational classic with a spectacular new release in Blu-ray High Definition! Join two of the world's greatest and most enduring superstars, Madonna and Antonio Banderas, in the epic musical event that is EVITA. Directed by award-winning filmmaker Alan Parker, EVITA is the riveting true-life story of Eva Peron (Madonna), who rose above childhood poverty and a scandalous past to achieve unimaginable fortune and fame. Despite widespread controversy, her passion changed a nation forever. 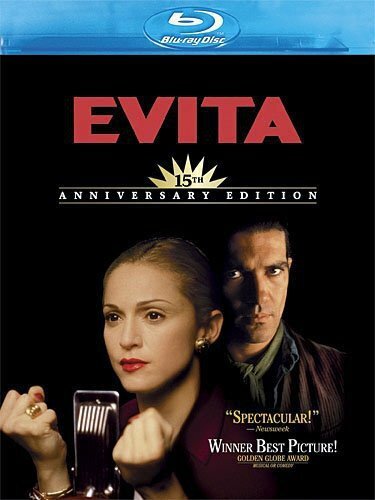 Garnering an Academy Award(R) for Best Song (1996, "You Must Love Me," by Tim Rice and Andrew Lloyd Webber) and 3 Gold Globe Awards (Best Picture, Best Actress and Best Song) -- critics across the world hailed EVITA as an indelible masterpiece. Now, with a new state-of-the-art digital restoration, you can experience every scene and unforgettable song like never before!